It has been a few days since I relaunched this weblog and I have been doing some tweaking to make things even better. Apart from resurrecting images from the dead (my gallery2 instance has been gone for quite some years, for example, and I have been digging through my backups for other content images too), I added some more people to the blogroll list, I enabled the related_posts plugin, fixed all kinds of small odds and ends in the templates and content of old posts (tagging, outdated links) and started tagging and linking some old articles to create some more context. While cleaning up all those missing pieces of content, writing some redirects to rewrite old links to new gallery links like hosted on my shuttereye gallery, I also decided to remove the blogmark weekly digest posts. Apart from the fact that they messed with the layout, they also clutter the archive, making 'real' content less visible. They of course also contains outdated links, but that's to be expected. 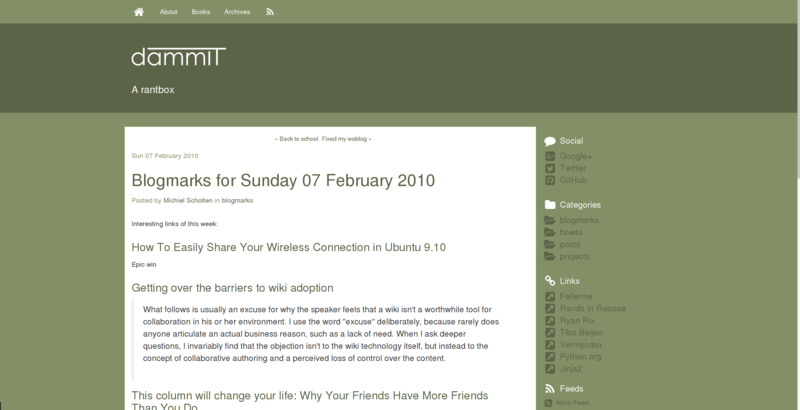 I would like to resurrect my blogmarks in a digimarks format, which will also check their current status (dead link and such). Announcement of go-live in due time. dammIT exists for 7.5 years now!